AIRcable's individually calibrated full power Bluetooth radios are many times more sensitive than the average Bluetooth device. That is the reason why you can expect over 10 times more range than with other standard Bluetooth dongles. 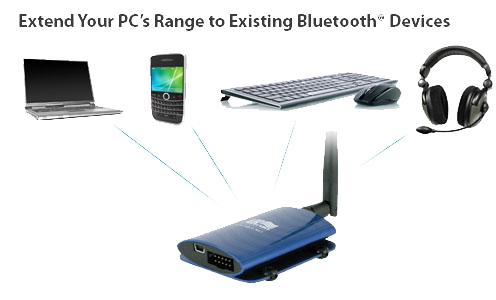 Extend the range of your PC to Bluetooth devices with the Host XR. These products plug into the USB port and work with Windows, OSX and Linux. They provide a standard bluetooth interface and require no extra drivers. Use it for connecting Bluetooth keyboards/mice, headsets for Skype, stereo audio connections and more. Using two of our long range products together with the biggest directional antenna we have certified with the FCC, you can achieve 10km range. Given you are above the Fresnel Zone.